What influences job search success? It’s one thing to have the tools to create the resume, cover letter and LinkedIn profile. 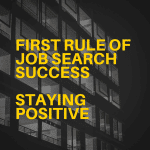 But there is one thing that influences job search success just as much and that’s your attitude. You may not even know or acknowledge that past experiences have taken their toll on you. But like any emotional trigger things can happen—sometimes at interview—that clearly show your true feelings. Here are just a couple of ideas of how you can move through the job loss phase effectively, because typically, none of us has the financial luxury of slowly reconciling our feelings over the loss of a job! The Job Loss Recovery tapes I mention in the video can be found here.